Today's blog hop is full of wonderful inspiration, technique and really super prizes! $40 dollars in prizes! Just stop at each blog and make a comment - the winner will be on Graciellie's blog spot! Today I want to show you a super simple way to make an elegant card! 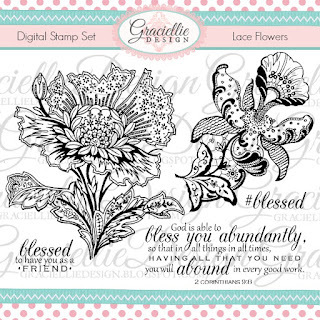 I'm using the Beautiful Lace Flowers set from Graciellie Designs ! This is so simple all you need is a few simple tools, Really Good Paper and maybe a little nail polish if you want to add some bling - I did! 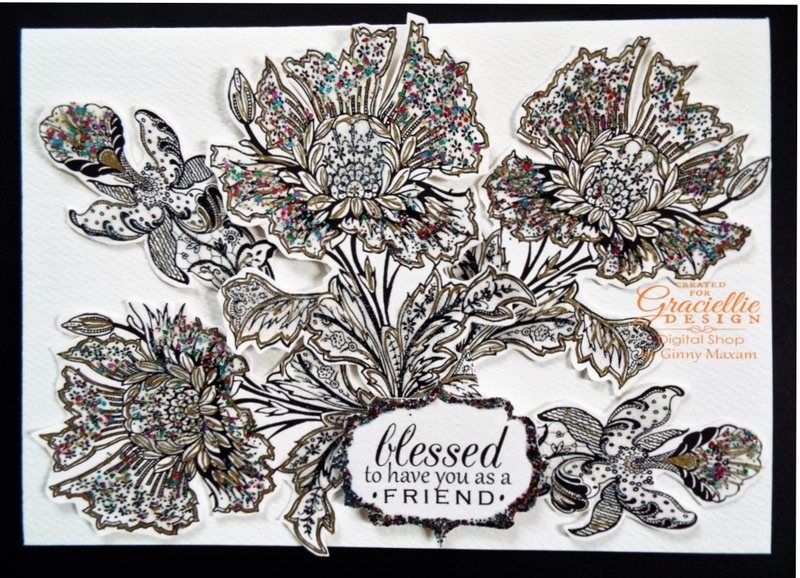 One of my favorite papers and one I used for this card is #120 Heavenly White paper from Paper Temptress, it is so beautiful with a slight pearl finish! I added gold with a paint pen. For this card I just looked around for a few simple things and a gold paint pen was sitting on my desk! I don't do my nails, I never have, these are working hands and I keep my nails short - I do however like a little sparkly bling on my cards! Nail polish is fast and easy to use, comes in it's own gloss medium and I can throw it in the grocery store cart! This card was made with one piece of paper and a few simple supplies. Don't you just love art? It is your world and your statement, no right or wrong! I'm blessed to have you reading my blog! This is an impressive card. Love the nail polish idea and the stamp set is now on my wish list! wow! gorgeous card with simplest things. Love it! Beautiful card. Thanks for your great idea. You are always so creative Ginny! Nail polish! Never would have thought of it, such a splendid idea. Beautiful card. So glad I hopped along and found you. Love this technique and your card! So Creative! I would love to copy your craft, if only to see the look on my husband's face when he saw me buying fingernail polish! (Never in the 30 years he's known me, ha ha!) Such a lovely card with beautiful lights. You've done such an amazing job with Gracie's images and Paper Temptress papers. You always amaze me, and I'm SO grateful for your wonderful art. Love these pretty flowers and your fun nail polish! Great idea! Wowsome.the bling due to nail polish..great idea..
WOw! That is one great and creative technique dressing up your flower. Gorgeous amd sparkly! Gorgeous!! I love the nail polish idea! I have so many and some are so sparkly and pretty! I love your nail polish idea. Thank you for this tutorial! Never would have thought to do this.